Dave Cohen of UkuleleMusicInfo.com, contributed this article for Ukulele 4 kids. If you’re thinking of purchasing an electric ukulele you’ll find a lot of useful information by reading this post. Thanks Dave! So you have decided to teach your kid how to play the ukulele. Upon your ukulele search, he or she might have expressed a specific interest for the electric type or you may have decided to get one instead of the electric guitar he/she asked for. No matter your reasons for choosing an electric uke, reading this guide will give you and your child extensive information for his/her ukulele training. This type looks, works, and sounds very similar to an electric guitar. Instead of a top board to project sound, it is designed to direct much of the energy of the played strings into the saddle or the pickups for amplification. If unplugged, a solid-body uke produces very little sound. These are hollow-bodied ukuleles that come with installed piezo pickups. They have the traditional sound of ukuleles but are intended to sound best when amplified. These are also hollow-bodied ukes with added piezo pickups but are more ideal for playing acoustically. These following tips will focus more on the first two electric uke types above. To get an additional understanding on how to teach kids from different age groups, read the complete ukulele guide for kids. To encourage your kid to get excited about learning to play the ukulele, constantly include him or her in the selection process. Making your child feel that he/she is taking home a ukulele of his choice will reinforce enthusiasm in learning how to play it. Of course, even with that in mind, you need to look for a model perfect for your budget and consider its overall quality and design. Solid-body electric ukes require amplifiers in their setups. Your kid can nonetheless practice unplugged, but connecting a solid-body uke to an amp will give him/her a far better experience with his new uke. Electro-acoustic ukes can stand alone without an amp but this type’s sound shines more elegantly when plugged to an amp. Look for an amp that is portable and easy to operate. Mini guitar amps work perfect with electric ukuleles. The common reason why children tend to back out when being taught to play an instrument is the failure to consider what kind of learning setup is best. Some parents will decide right away to hire an instructor. Some will sit with their kids personally. Others choose to learn to play the ukulele together with their kid. The goal here is to make the learning experience enjoyable and not stressful for your kids. Remember that we are dealing with kids with different dispositions and attitudes. If you want his or her ukulele education to be successful, managing the pace of teaching your kid greatly matters. For younger age groups (5-8 years old), it is best to start the whole process by teaching them to play their favorite nursery rhymes or cartoon show theme songs. These songs usually contain the most basic chords. For older kids, you can experiment with their favorite pop songs. You should also check how fast your kid can pick up and learn concepts to figure out when is the right time to take on the teaching to a level higher (whether you decided to sit with him yourself or hire an instructor). Your immediate reactions to their failure and success also affect how they will learn. You should be patient with them at all times. This is a good technique to associate your kids’ practice with the joys of playing instead of the dread of another required lesson. Practice in a favorable context will give your kid more eagerness to participate. And as for practice, it is a common known fact that constant practice helps in ingraining skills in a person, especially in kids. As your kids gradually advance in the ukulele skill ladder, you can further excite them by bringing in new effect gadgets in their electric ukulele setup. You can add a stompbox or multi-effects to play with delay, reverb chorus and more. If your child by chance loves metal or rock and roll, you can delight him/her with a distortion pedal. The fun of letting them explore and experiment with more sounds with definitely make them look forward to having their everyday uke sessions. The ultimate goal here is to give your kids a fun experience with their new tiny instrument. From time to time, you can jam with them, infuse exciting treats during practice, invite their friends over or even let them perform in front of the whole family to boost their confidence. Learning to play an instrument sure has its cognitive benefits. Most agree that teaching kids to play instruments is an opportunity to instill discipline and the virtue of patience. Teaching them to play the uke opens that window too. We wish you and your kids good luck in your ukulele journey. Happy strumming! For additional info regarding ukulele reviews, tips and more visit UkuleleMusicInfo.com! Whether you’re looking for the best ukulele songs to hone your playing, entertain your friends, boost your mood, or impress that special someone, look no further than ‘The best ukulele songs for any occasion‘. They’ve compiled a great list of the best ukulele songs for any and every occasion. No matter what level ukulele player you are, search through their master list to find the perfect song when you need it! We’re learning to sing the song, All my loving, by The Beatles. Photo by Tiaria. This week my class is running the school assembly, and to be different we’re going to sing the school a Beatles song – All my loving. I’m playing the ukulele and the kids are doing the singing. They sound great already, and now want to make a YouTube video – Great! You can download the ukulele chords here. 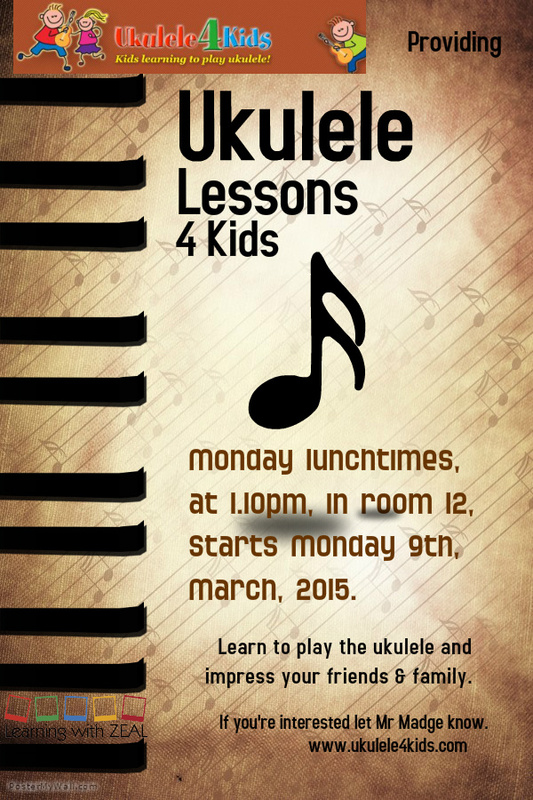 Ukulele 4 Kids is beginning school lessons again. 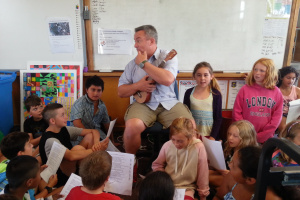 I’m looking forward to starting next week with a new bunch of enthusiastic ukulele players. Below is the poster I made using PosterMyWall. Go and see what else happens in my classroom at Learning with ZEAL. Ukulele 4 kids recently shared a great video of 15 year old ukulele player Yestyn Griffith playing While My Guitar (Ukulele) Gently Weeps. So we asked him to answer a few questions about his ukulele playing which he answered below. Q)Tell us a little about yourself. My name is Yestyn Griffith. I am 15 years old. I live in Henderson, Nevada (USA). And I am currently in my sophomore year at Basic High School. Music is the majority of my life. I play several instruments including the violin, requinto and of course the ukulele. Q) How long have you been playing the ukulele? I have been playing the ukulele for about a year and a half. But I had been playing violin for two years before I started ukulele. Q) What influenced you to start playing the ukulele? I honestly started the ukulele because my friend gave me a soprano (ukulele) that had been sitting in the corner of his house for who knows how long. I had almost no knowledge of the ukulele before that. It wasn’t till a few months later when I saw Jake’s (Shimabukuro) While My Guitar Gently Weeps video that I discovered what the ukulele was really capable of. Q)What are your ukulele playing strong points? I think that my strongest musical attribute is my ability to figure out songs by ear. I can figure out most chord progressions within seconds, and I can figure out melodies very quickly as well. I am also very good at improvising while playing with others. Q)What are your ukulele playing weak points? I find that my weakest point as a musician is my lack of character. All of the music that I play sounds like somebody else’s music. I have no real noticeable style or “mark”. Q) What are your ukulele playing goals? In the future I hope to develop a distinct style that can be recognised by others. Other than that I just hope to keep playing and advancing. Thanks Yestyn for giving us an insight into your playing. I’m sure we’ll be hearing more from Yestyn in the future. Ukulele 4 Kids invites other young players to share their playing with us.